How do you talk to your co-workers? In person? That’s SO 20th Century! Via email? How 2002. Intra-company instant messenger? Don’t even get me started. At least, that appears to be what Facebook and LinkedIn think about it. How else can you explain both companies diving into the enterprise social network game? Both companies want to “revolutionize” the way you communicate within your company. And they want to do it using tools you’re familiar with. 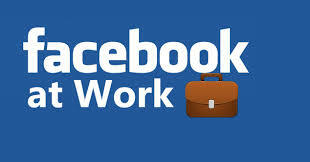 Facebook’s new system, helpfully titled Facebook at Work, wants to help you… Facebook… at work. Not to be outdone, LinkedIn, long the refuge for professionals who want to get in on the social media game, is testing its own enterprise systems. Are either of these enterprise social networks going to be useful to your practice? Have you ever felt like all your office needs to be complete is an enterprise social network? Facebook thinks so! (Either that, or they really want a way to rope in those of your co-workers who don’t use regular Facebook – which has been suggested.) The idea is that your office gets to create its own internal social network. By connecting, all the employees are able to communicate, collaborate, and Facebook-stalk each other in the office. Interestingly enough, this is apparently a public version of Facebook’s internal enterprise social media setup. One of the potential strengths of the system is that Facebook is so popular that everyone is familiar with the platform. That means there will be no learning curve. The true strength of the platform is that it allows for communication, like an internal instant messenger system. In addition, individual groups can be set up to allow for sharing documents and collaborating on projects between just a few employees, all the way up to the entire company. The most interesting element is probably the options that exist for setting up accounts. Employees can either use their own Facebook profile or they can create one just for use with the enterprise social network. I’ll be honest, I’d love to know what most people end up going with. 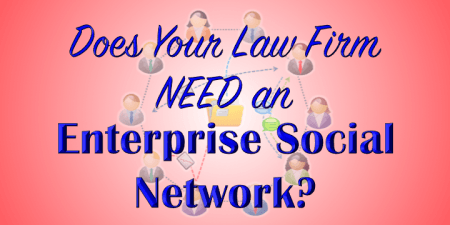 Can it help your law firm? In all honesty, it probably can. Bigger firms will be familiar with internal communication systems. Most attorneys are familiar with Facebook, at least on a personal level. And most law firms could really benefit from the collaboration tools available. In all honesty, I wonder if the biggest obstacle to seeing this system becoming widely adopted in the legal profession is the fact that it has Facebook in the name. While not ready for prime time, LinkedIn is currently testing two new tools it hopes will allow for better communication within a company. While not directly competing with Facebook at Work, it’s quite clear that LinkedIn wants to make sure that it can leverage its position as the “professional” social network before Facebook at Work gains any traction. However, among the major elements missing from LinkedIn’s offerings, neither contains a real-time messaging capability. 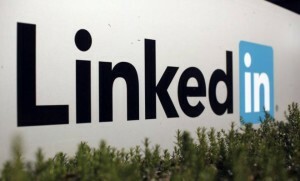 However, LinkedIn wants to change that, and make InMail your company’s internal communication system. While not technically an instant messenger service, what the new tool will allow is for InMail to coworkers, even if you’re not connected on LinkedIn. Additionally, each company would be able to create and maintain its own internal contact system. The system would encourage everyone in the company to post up-to-date contact information, accessible by anyone within the company. This new InMail/Contact system is part of LinkedIn’s attempts to create more intra-company tools. At the moment, LinkedIn is primarily used for connecting with people outside of your current job – whether as part of a job search or connecting with people in your industry. The second tool LinkedIn is expected to begin testing later this quarter will allow for easier sharing of content within your company, perhaps even within smaller groups. LinkedIn recently updated its homepage with some small tweaks just to make this particular tool more useful. With LinkedIn, there’s less of a concern for me that law firms would resist adoption based on the fact that it’s a social platform. LinkedIn is a professional social network, and the one network that law firms have actually adopted at a greater rate than even their individual lawyers. So if adoption isn’t a problem, what could be? Well, it’s not the internal communication system that Facebook at Work has. On the other hand, it’s a professional sharing and collaboration system that your law firm may embrace. Personally, I don’t think that the internal email system is really all that useful.